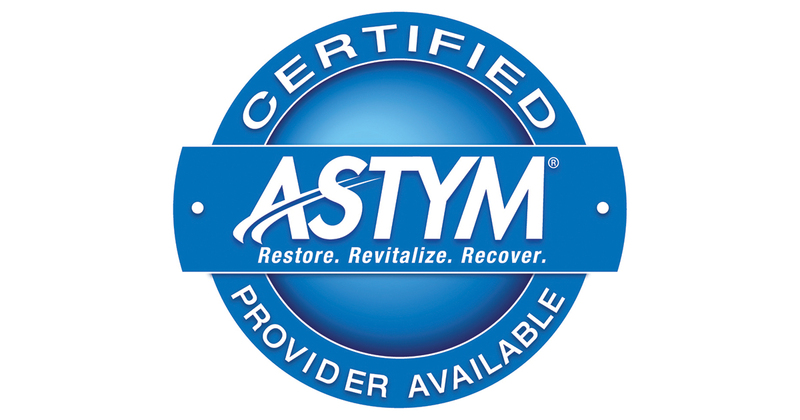 Astym® (A-stim) treatment sets the standard for soft tissue therapy. It promotes regeneration of healthy soft tissues (muscles, tendons, etc. ), and remodels unwanted scar tissue that may be causing pain or movement restrictions. Astym has helped countless patients by restoring their movement, getting rid of their pain, and giving them back their lives. This specialized treatment technique targets tissue degeneration and/or excessive fibrosis. It can benefit patients who are suffering from tendonopathy, post-op/post-injury scarring, recurrent sprains/strains and tendonitis. With conditions such as lateral epicondylitis and plantar fasciitis, it stimulates the involved tissue to regenerate and heal properly. It can also target scar tissue which can interfere with complete recovery following joint replacement, surgical procedures, casting, and prolonged splinting. To supplement this specialized technique, our Astym certified therapists design customized stretching and strengthening programs to encourage their clients’ bodies to heal properly.